Tristan moved to USA and started his coaching career with Metro Stars (NY Red Bulls) as a Player development coach 2002. After two years he then moved to Texas with Express soccer club (Wichita Falls/Dallas) as a head soccer. He then moved to Austin to coach for Revolution SC as a head soccer coach. 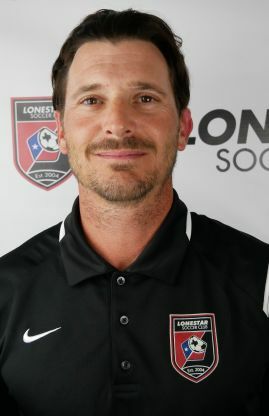 From there he coached for Austin United Capitals SC as a head soccer coach, Forza FC (Austin) as a DoC, Dallas Texans SC (Austin) as a DoC and Lonestar SC (Austin) as an assistant DoC for the girls premier league. Sting SC (Dallas location) as technical Director. He returned to Lonestar and worked in the Girls ECNL for 2 years. He is now working with the boys program as a head coach in the Boys’ ECNL. Tristan has been at Lonestar since 2011. Tristan was born 1979 and raised in England. He represented South of England as a school boy representative. He signed YTS forms with Tottenham hotspur Football club (2 year youth professional) and Brighton and Hove Albion football club (2 year professional). Unfortunately his career was cut short due to injury. While playing soccer as a youth, Tristan has always been interested in coaching.